Hungarian authorities have confirmed that former Macedonian Prime Minister Nikola Gruevski is in Hungary and has sought political asylum. The relevant Hungarian authorities have notified the Macedonian Interior Ministry about this. 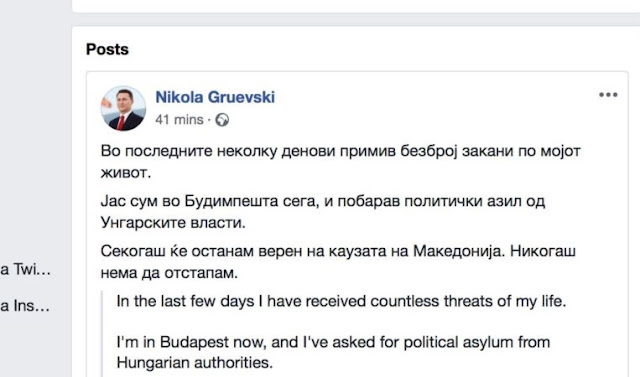 Mr Gruevski, who is wanted by law enforcement officials announced Tuesday through Facebook he was in Hungary where he is seeking political refuge. "In the last couple of days I got a lot of life threats. I am now in Budapest and have sought political shelter from the Hungarian authorities. I will always be faithful to the cause for Macedonia. I will never retreat," writes Nikola Gruevski. Gruevski had very good reports with the Hungarian Prime Minister Victor Orban while he was on charge of the government of Skopje, even after. The foreign ministry of Skopje has called on the Hungarian ambassador to Macedonia, who also confirmed Mr. Gruevski's presence in Hungary. Officials in Skopje say the Former Prime Minister has not left the country via official border crossing points. His passport has been seized for more than a year since the lawsuits started against him. Minister of Internal Affairs, Oliver Spasovski, while avoiding falsity, blamed the criminal court "who did not gave to Gruevski the measure of detention, knowing that he could escape." Macedonian police authorities say police cannot prosecute any person without judicial authorization.